DG Canum Venaticorum (Giclas 165-8) - Red dwarf (M4V) 26 light-years from Sol. A brown dwarf (L7) closely orbits this star, occasionally causing significant flare activity. 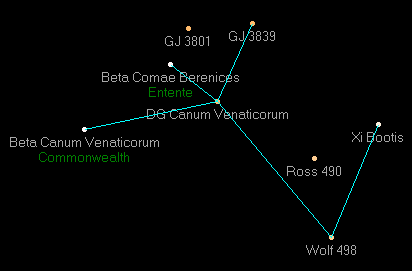 Located in the International Ring, this star hosts wormholes to Entente (Beta Comae Berenices IV) and Commonwealth (Beta Canum Venaticorum IV), as well as to the interstellar holdings of Brazil, Arabia, Thailand and Israel.